I am a band geek. This anime had me jumping up and down in my seat with each new gorgeously designed set piece. The bass clarinet had an upturned mouthpiece. The clarinet had a real ligature. Some of the trumpets were silver. Some were gold. All looked amazing. They modeled a bass trombone, every last curving tube, even the trigger mechanism in the corner of the screen. The band had its one double bass--and they're a main character. They had a barry sax. A yamaha tuner with both metronome and tuner buttons. All of them. They performed a band full tune to the clarinet. The euphonium player used to play baritone. A character lifted up a mouthpiece, and right then I could tell it was a tuba mouthpiece. I didn't have to remember that the girl is holding a tuba on the cover. It sounded like a tuba mouthpiece. The Iphone tugged at its headphones while dropping just enough to suggest what would happen in real life. There are scattered pins on the main girl's cork board that don't have papers to pin down. And that's just half of what I noticed on my first viewing. Amazing. Band geeks rejoice. Good plot, Good set-up, Top quality. It's just my cup of tea. - I don't know anything about Sound! Euphonium before. - I write this on EP1. (Don't judge book from cover). What is Sound! 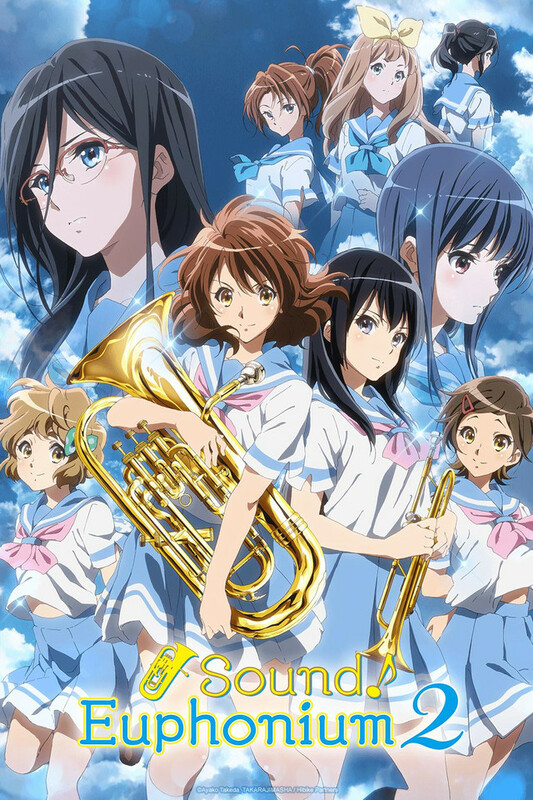 Euphonium ? This is Slice of Life anime. If you are looking for something exciting, you are wrong place. And I don't think this will be heavy drama like Your lie in April. However, It sure has more sweet stories behind. Prequel story in EP1 is really good and catch my feel. Guys, this one is real good. KyoAni never disappoint us. Very nice scenes, cute & well designed character. Fluid & natural motion. Voice acting suit their character. OP&ED, inserted songs are great. I might overate it. But, well, this is far more than enough for "Slice of Life" kind of anime. It's not action sci-fi that need this much quality. Story lead by normal girl "Oumae, Kumiko". She was in top band before but she try to quit. So she decide to enter plain high school with zero reputation about band. However many things remind her about her old time. Let's see how she turns back to this path. So this series brought back a lot of memories for me. I joined band in elementary school, and played all the way up through college. I actually played the Euphonium too! So this anime hit close to home. Every emotions everyone was feeling in the series, to their dedication, compassion, and disappointment, I easily could understand. Even the friend experiences, and competitions between band members. I hope they continue with this anime, and we get to watch a 2nd season. An easy recommendation for anybody who did band in High School, as this series really captures many of the exaggerated emotions and drama that seem to come right along with that activity. The show is packed with details, particularly the audio track. It can't have been easy to capture all the nuances of performance, but I feel the music really seems to fit with the action and plot. I'd be quite happy to see a second season of this, as the band preps for Nationals! You got your casual high school with a concert band in need of becoming number one. Its got a good plot that I can focus on and the characters show promise with their friendship and as they get better over the school days. As a band student who plays the stand up bass, I can relate to this and understand the obstacles they have to overcome. It's also a great anime to get into even though you don't play any musical instruments. So far this anime has helped me to come realize that don't give up on what you like to do. With that being said "give 'er a shot m8!" I was one of those nerds who was in the marching band all of middle school and high school back in the day, so I was sort of intrigued by the idea of a marching band/ concert band themed show. It's pretty accurate, from my experience anyway, and the quality of the characters and story really rekindled some nostalgic feelings I didn't even know I felt for that time of my life. Extra bonus points for the Yamaha product placement all over the place (my high school band had a whole new fleet of Yamaha drums purchased my freshman year). The characters are all written deceptively complex, especially the main character, and I love that there is very little fan service and moe- pandering (much, much less than what I remember from K-on)- so the show has a slightly more mature air to it that I really appreciate. The students' relationship with their band director is particularly interesting as well, and is written as deftly and skillfully as the interplay between each student in the band (thankfully consisting of both male and female characters). I really like this show so far! - Animation quality: mesmerizing, one of the best I've ever seen. The blur and the lights are nerdgasmic. - Soundtrack: wonderful selection, the expectations were high considering the theme of the show and it did not disappoint. I love how they show you the difference that makes when you play with sentiment rather than playing mechanically. - Characters: Most of them are quite interesting. Some are exceptionally strong and mature, some others are still growing up but that is how real life look like. The relationship between Kumiko and Reina is the cherry on the cake of this show but I'm not spoiling anything. -Female characters own this anime, the cover tells a lot on its own. I can think of a couple of relevant male characters and that's it. This did not affect my judgement as I don't mind but maybe you might. Curosities: Most of the places that are shown actually exist in the real word. There are videos on youtube that show them.. There are also landmarks scattered around in Kyoto marking some of those.